This was an Easter Brunch standout. It was easy to prepare the night prior, baked up puffy and was delicious. Will prepare again, looking forward to playing with variations. I made this and the ham asparagus and swiss variation and this was declared the winner--bacon wins! I made this, along with the bacon variation, and while most preferred the bacon version, I like this one and thought it was a bit lighter (as if that's possible with bread + eggs + ham). Perfect brunch party food. Very tasty. Nice size. It would be great with a tart apple or a combination. Great topping. Coffee Cake favorite. Made more muffins than the recipe said but they were good--so no problem. I might use less sugar next time. Some candied citrus peel in place of some of the cranberries would be good, too. This is really your basic fruit salad but I really liked the addition of pineapple juice. 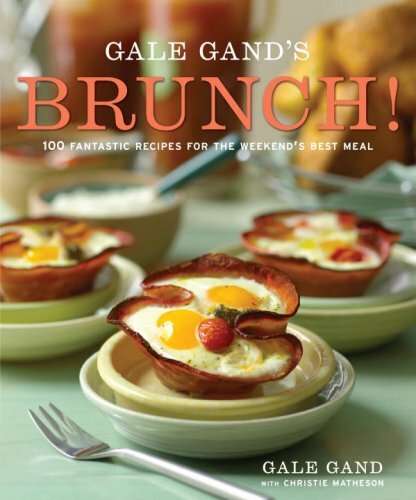 Gale Gand’s Brunch! she shares 100 recipes for scrumptious brunch fare, all destined to become household favorites.